As we sat down to reflect on everything that happened in 2018 - we are blown away with how much our lives have changed. A year ago Tayne and I weren’t small business owners. A year ago I wasn’t my own boss. A year ago I was chasing someone else’s dreams. We’re reminded that we have flexibility. We have freedom. We have opportunities. 365 new opportunities just waiting to be uncovered. For now, as we take time to reflect on this past year and plan the adventures of 2019, we are reminded by how much we have grown and accomplished in 2018. Our journey started here - we found a local maker space facility where they offered laser cutting during open studio hours. We both took the class and learned how to use it - what materials we could cut and etch on, how to set up our files properly and how to use the machine safely. 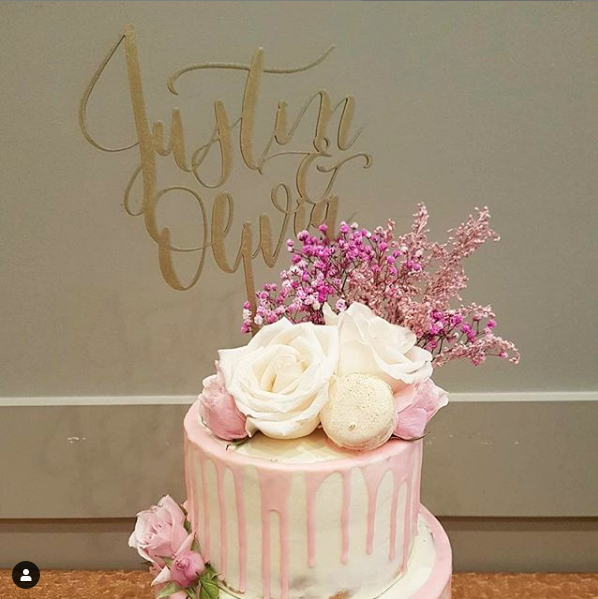 We started our by making cake toppers for friends and family, also dabbled in vinyl lettering and cutting and personalizing all the things! We also enrolled in a Panic Free Pricing course by The Happy Ever Crafter & In Detail Creative. We had no clue what we were doing or how to start pricing our creative services. This was a good start. In March we seriously considered starting a business together. Once snowy weekend - we decided to create a business plan, actionable goals, and open an Etsy Shop. In March, Ashley also got serious about lettering and learning from the ground up. She had taken online classes and workshops before since 2014 but never was consistent enough to stick with it. She found the group called The Happy Ever Crafter and started with the Basic Strokes. We had our first partnership with September Charm Flowers where we designed and laser cut fun laser cut and etched wood pics for floral arrangements. 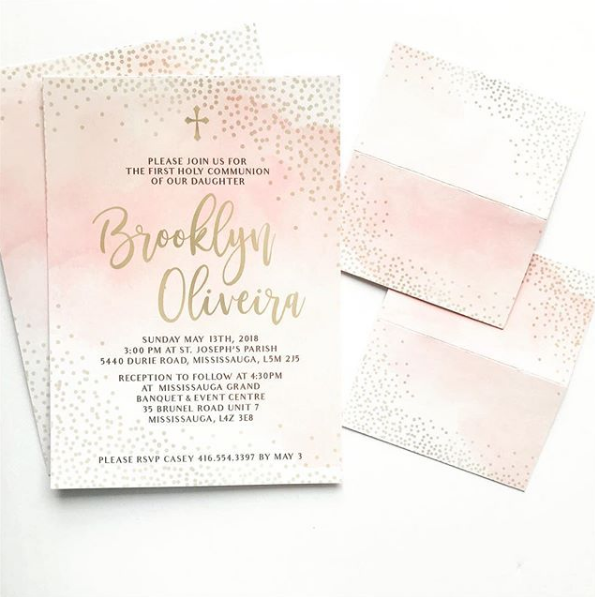 We also worked on a dreamy First Holy Communion set for Brooklyn Rose, which consisted of blush pink and gold details - both printed and laser cut. We started shipping in Canada (mostly the GTA) with Etsy. On a personal level - We did our engagement photos with Ariana del Mundo! In May we made so many cake toppers! Communion, Baptisms, Bridal Showers, Weddings, Birthdays and more. We packaged and shipped orders across Canada & the USA! We started offering wood signage. 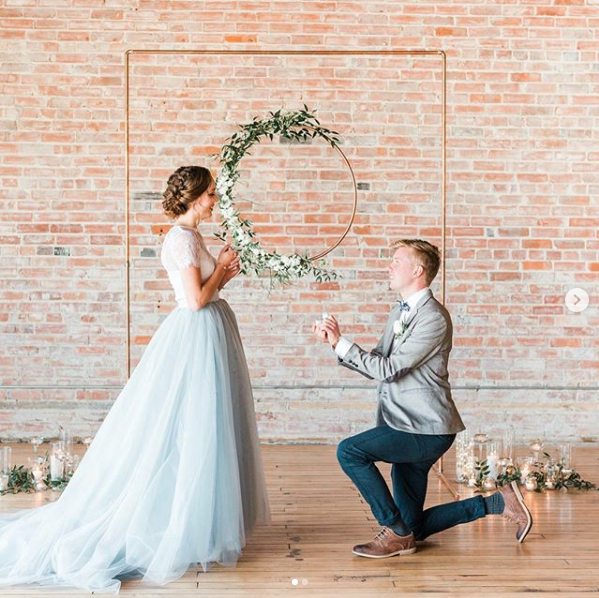 We participated in our first styled shoot with Ariana del Mundo and Chelsea Noel Photography - it was a surpirse proposal which was later published multiple times including on The Knot How He Asked. May was also the start on a very busy (and first!) wedding season. We attended the Burlington Made Spring market as guests and met the lovely Sydney from This & That Design Co. We quickly became good friends. Sydney is one of the kindest people we know. She helped us navigate the maker world. In June we started offering clear acrylic signage including reserved signs, welcome signs, and seating charts. We also did our first seating charts in June - Mirror and acrylic. Ashley started learning pointed pen calligraphy with the same principals from The Happy Ever Crafter’s Basic Strokes. We also made and started offering custom rubber stamps! In July, Ashley designed the Hamilton Etsy Team logo. Baby name signs exploded after we made a couple for friends as baby shower gifts. Ashley took a Via Calligraphy Brush Lettering workshop and learned tips and tricks from one of the best in the industry. Wedding season is also getting busier and busier! 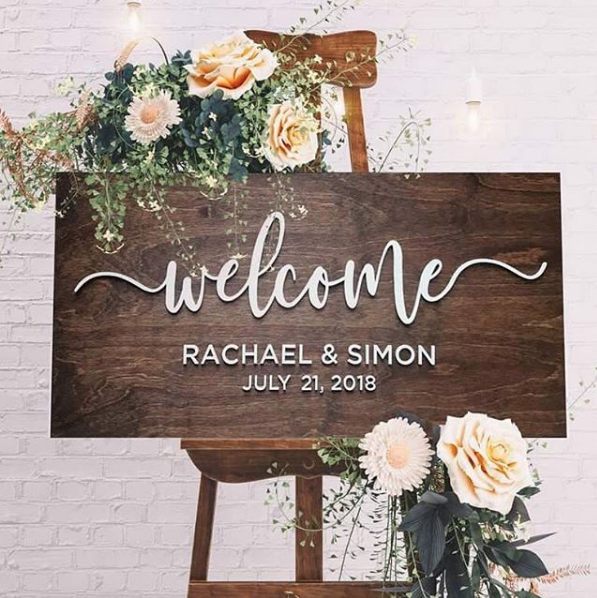 Wood signs, seating charts, custom bridal party hangers, and so. many. cake. toppers. Just kidding!!! This is probably our busiest month. This was the month of saying “Yes” too much. We said yes to our first ever in person market, Market in the Village, the day before, because a spot opened up and well - it was free! We designed and build a custom peg board display in one night (including a single trip to home depot). We also took on our biggest mirrored seating chart ever - at 260 guest names. We did the Georgetown Farmers Market for 2 weekends and met some pretty awesome people including Amaros Media - which we later worked together on a styled shoot. We hosted a vision board workshop. We BOTH took Cabin Calligraphy’s pointed pen workshop in Barrie also! We also took Someday Art Co. Business Babe course to learn all things calligraphy and pricing for business. As creatives - it is so important and vital to be on par with one another on pricing! The Discount Debby isn’t cute - and often leads to clients price shopping you vs. choosing you for your work and style. Andddd we did a tonne of custom Etsy orders and baby name signs. It was bananas. Market prep in full swing! We were a vendor at the Etsy Made in Canada: Hamilton market. Tayne started custom illustrations including pet portraits and venue/house illustrations. More styled shoots, and more wedding signage! September was equally as busy! We also launched some fun keychains that were a big hit. And some generic cake toppers and signage that wasn’t! This year has been all about learning what works and what doesn’t as we go. October we were style doing wedding signage, planning 2018 workshops, and launching holiday custom ornaments. We had pet portrait commissions and attended Cabin Calligraphy’s Chalk Board Lettering workshop together. Ashley also attended Via Calligraphy’s Watercolour lettering workshop. In October we started our Instagram pod with a group of Canadian Calligraphers. We also hired a book keeper, Jessie from The Boost Up - because well numbers are hard and we could not wrap our creative heads around it. She has been a complete angel and delight to work with! Market prep! Holiday Ornaments! Workshop Planning! Burlington Made prep! All before we went to Disney World for a week with Tayne’s family. It was an incredible trip and a much needed break from the hustle life. When we got back - we were a vendor at the Burlington Made holiday market. We got to sponsor the wood logo sign at the selfie station! It was a surreal experience because we attended as guests the year prior. We were in awe of all the makers and dreamed of starting our own thing together one day. We offered custom calligraphy ornaments - on the spot (no pressure lol). 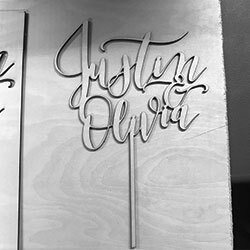 From the time the doors opened, to the time the event ended, and then again well into the evening, Ashley was hand lettering custom ornaments. They were such a hit and just a joy to make. Later that week we taught our first workshops - Intro to Brush Lettering and DIY make and take ornaments. They were so much fun! Teaching sparked a joy in me that I didn’t realize was there. It was so rewarding to see our students learn and progress in just 2 hours, and then receive messages and tags on social media the days and weeks to follow, sharing their progress. In December, I made the bold decision to go full time in this little “side hustle”. The weeks to follow that decision were so reassuring - Our work was on Inside Halton TV with Burlington Made for the St. George Market. We were a vendor alongside some fantastic makers at the Merry Market in Milton. Our work was published in Weddingbells Magazine’s Spring/Summer 2019. We were awarded The Knot’s Best of Weddings 2019. We ended the year with an awesome partnership with Mapleview Centre here in Burlington. We did live calligraphy on clear acrylic ornaments as part of their Share the Joy holiday campaign in support of McMaster Children’s Hospital. As I finish writing this post - I am just blown away by this whirlwind of a year. It was a year of a lot of firsts, risks, growth, opportunity, new friendships, and lots of learning. I’m such a Sensitive Sally so naturally I’m balling my eyes our right now as I finish up here. We are so grateful for everything. Each and every customer, couple, client, friend, person, partner, and opportunity that has come our way and paved our path. We have so much in the works and coming down the pipeline for 2019 including new partnerships, new workshops, a NEW PUPPY, and we’ll be tying the knot in 137 days! Cheers to 2019! Let’s do this!